Have a question on V40? V40 is available in 2 different colors - Blue and Light Blue. Watch latest video reviews of Volvo V40 to know about its interiors, exteriors, performance, mileage and more. This smart crossover by Volvo is the last designer element by British designer Peter Horbury built on the platform of Ford C1 with alterations done to its mechanical and suspension system. 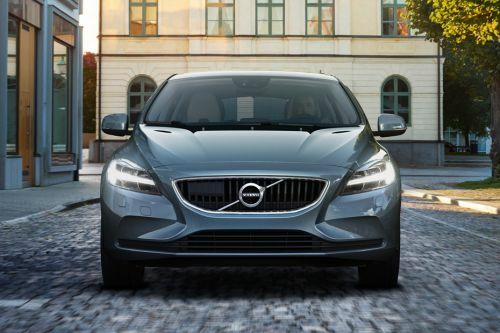 V40 revealed its first face to the world in 2012. Afterwards, the 2014 trim was launched fitting inside in-house developed diesel and petrol engines offering discretion to its occupants and wide range of engine performance. Same is been offered to UAE residents with this vehicle. Although, if you give much preference to the looks, V40's R-Design will serve your motive the best. The interiors of V40 is incorporated with plenty of convenience features which brings a fun to drive experience for its occupants. Offering maximum comfort, seats of V40 are designed specifically wherein you can even sit for hours in continuous stretch. Moreover, the ambient lightning feature creates welcoming aura inside. Also, with the help of this you will not fumble ever looking for any door pocket or cupholders. Packed within exceptional communication system, you will experience a different life inside the cockpit. Few infotainment features are Bluetooth handsfree system, Volvo on call app, DAB, 4x25W audio system with CD/MP3 player, radio, AUX input and six loudspeakers, 5.7 inch screen and much more. To laden your cargo, 335-litres of boot space is offered by V40 trims. The Swedish automakers has given this 5-door crossover an innovative designed structure homogenizing plenty of conspicuous exterior inserts. The most striking key feature of this stylish vehicle is perforated radiator grille highlighted in chrome-finish and is mounted with prominent Volvo insignia at the centre. Its strong bonnet houses energy efficient LED headlamps and daytime running lights that lits automatically during daylight. All the variants are appointed in wheel size ranging from 15-inch steel wheels to 18-inch alloy wheels. Providing a spacious cabin to its occupants, it has specific dimensions measuring 4369mm x 1783mm x 1420mm (L x W x H) along with the wheelbase of 2647mm. For UAE residents, the latest Volvo V40 is made available in five variants including Standard, Kinetic, Momentum, Summum and R-Design. These variants are powered in an array of diesel and petrol engines. The maximum power output across all the engine is given in the range of 115 HP at 3600 rpm to 254 hp at 5400 rpm along with the peak torque ranging from 270 Nm between 1750 to 2500 rpm to 360 Nm between 1800 to 4200 rpm. Furthermore, discretion is offered in the drive wheel pattern (FWD/AWD) mated with start/stop technology, engine braking energy regeneration and six-speed geartronic/manual/powershift transmission. Largest 2.5-litre petrol engine doesn't disappoint you when it comes to pick up numbers, you can cover 0-100 kmph speed mark with this engine in 6.1 seconds at the earliest. Moreover, you can attain best fuel economy going for 1.6-litre diesel engine that delivers mileage of 3.1 l/100km in combined driving cycle. When it comes to safety, all the variants are equipped with plenty of safety elements offering maximum protection to its occupants. For driver's assistance, Adaptive Cruise Control (ACC) with Queue Assist, Collision Warning with Full Auto Brake and Pedestrian and Cyclist Detection, Active High Beam (AHB), Road Sign Information (RSI), Blind Spot Information System (BLIS) and Cross Traffic Alert (CTA),Driver Alert Control (DAC), Lane Keeping Aid (LKA) are employed to avoid collisions. Furthermore, several braking and handling features equipped within this car ensures your safety, keeping the vehicle on-track and reduces possible injuries. Volvo V40 is a stylish, practical and sensible crossover which is a straight rival its more expensive competitors. However, the looks might not suit everyone. What is the price of Volvo V40? On road prices of Volvo V40 2.0 T5 R-Design in is costs at AED104,895 . What are the colors options available in Volvo V40?